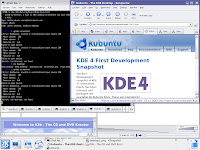 It was announced yesterday that a new beta version the KDE 4 desktop for Linux is now available for download. Just in case you don’t know there are a choice of desktop interfaces for Linux that sit on top of the core of the system (known as the Linux Kernel). The 2 most popular ones are the Gnome desktop which is the default in Ubuntu amongst other distributions and KDE which is the default in SuSE Linux for example. No matter what Linux distribution you run you can install pretty much any desktop you want so you are not tied down to the distro default. As with many things in the tech world there is something of holy war between the Gnome and KDE fans which personally I find annoying and distracting from things that really matter. I do prefer to use Gnome myself but I’m not going to bash anyone for using KDE, isn’t that what open source is supposed to be about, freedom of choice? I realise some seasoned Linux users will find that information very boring and apologies for that but it occurred to me recently that we penguin fans drop obscure terms around as often as Windows defects are announced and newcomers can feel left out of the picture. So, the latest beta of KDE 4 is now out and the code has been frozen before the final release. This basically means that no new features will be added and only refinements and bug fixes will now be allowed in. This version of KDE is the first to ship with a new file explorer known as Dolphin. This is in addition to the standard Konqueror interface which KDE fans know and love. Basically it’s the equivalent of Windows Explorer for all you MS users out there (why do you do it to yourselves?). The thinking behind this is to make file management easier and quicker for users through Dolphin while still allowing those who prefer it to use Konqueror. It’ll be interesting to see how this develops but the KDE team are stressing that there are absolutely no plans to drop Konqueror. We’ll have to see how that one develops. As I mentioned before I’m a Gnome user and a big fan of the desktop but I have to say the advances in KDE development are intriguing me a bit, they seem to have more forward impetus at the moment and I think Gnome needs some new ideas and improvements. ‹ Are You Ready For Software Freedom Day 2007?